You can also add links to your social media pages on your HubSpot template with the Follow Me module, and connect your Bitly account to HubSpot to use your own branded short domain when shortening links in social posts. The Accounts tab displays the social account settings. 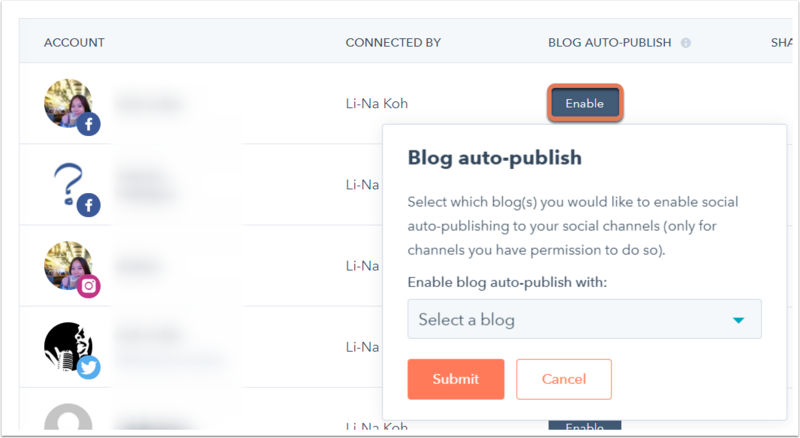 If your blog is hosted on HubSpot, you can set up blog auto-publishing to publish a social post with a link to your blog content on your social accounts when you publish a new blog post. These social posts include the blog post title, meta description, link, and featured image, and are published 15 minutes after the blog post is published. Learn more about blog auto-publishing in HubSpot. Please note: blog auto-publishing is not available for Instagram accounts because links are not allowed on Instagram posts. In the accounts table, select the checkbox in the Share column next to a social account to allow all other users in your HubSpot account to post to that social account. Your changes will be saved automatically. In the accounts table, select the checkbox in the Default column next to a social account to select it by default when you create new social posts. Your changes will be saved automatically.